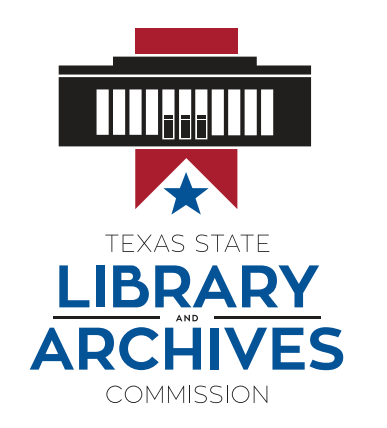 and the Texas State Library and Archives Commission (TSLAC). The Digital Texas Heritage Resource Center will make items from Southwestern’s Texana collections digitally available to the public by connecting them with the University of North Texas Portal to Texas History, which is a Digital Public Library of America (DPLA) Hub. (Read about the relationship between the Portal to Texas History and the DPLA here.) We at Southwestern are very excited to connect Southwestern’s unique special collections with state and national networks that are significantly enhancing access to archives for students, scholars, and educators. As part of the team working on the Digital Texas Heritage Resource Center, I’ve been working on transcription and metadata tasks for the Thomas Falconer Correspondence. Falconer was a British lawyer turned explorer on the Texas frontier. As a colleague of Falconer’s relayed in an 1841 letter, during a trip to Austin in that year Falconer was enticed to join “an exploring party of 300 armed men consisting of traders to the Mexican posts + other hardy adventurers… [T]he large scope for scientific observation proved an irresistible inducement to his joining in traversing the fierce wilderness hitherto scarcely pressed by the foot of civilized man.” On the way to its destination of Santa Fe, the expedition was brought to a halt and its members taken prisoner by Mexican soldiers; Falconer describes the episode in his book “Narrative of an expedition across the great southwestern prairies, from Texas to Santa Fe; with an account of the disasters which befell the expedition from want of food and the attacks of hostile Indians; the final capture of the Texans and their sufferings on a march of two thousand miles as prisoners of war, and in the prisons and lazarettos of Mexico.” Falconer’s writings provide insights into the border tensions that would culminate in the U.S.-Mexican War of 1846-1848. Below is one letter I’m trying to transcribe; can you read that script?? Tricky, isn’t it! 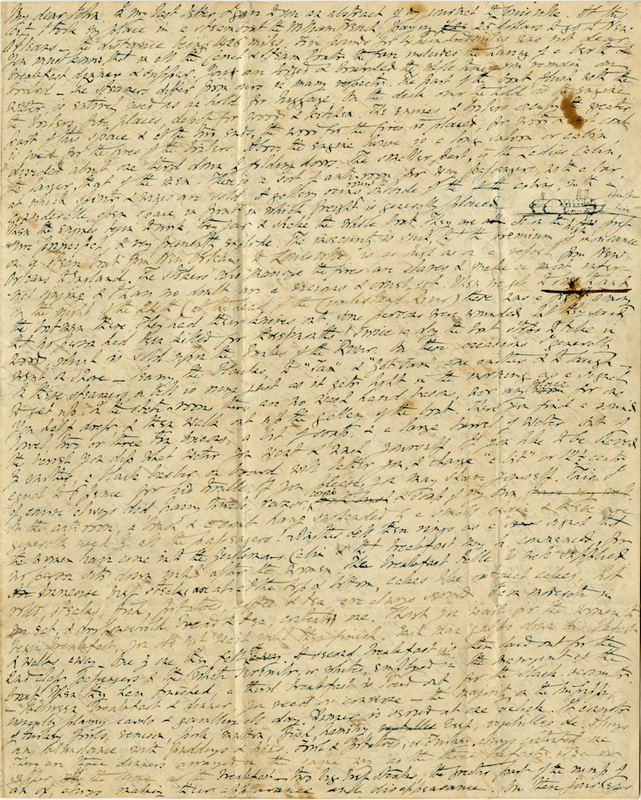 The letter, dated December 5, 1841, recounts a steamboat trip Falconer once took on the Mississippi River, from Louisville to New Orleans. Zooming in: check out Falconer’s teeny-tiny drawing of the steamboat! In addition to improving access for researchers and students, transcribing the letters is useful for the process of collecting metadata, as it allows us to identify people, places, and historical events to include in the “Keywords” section of Adobe Bridge. 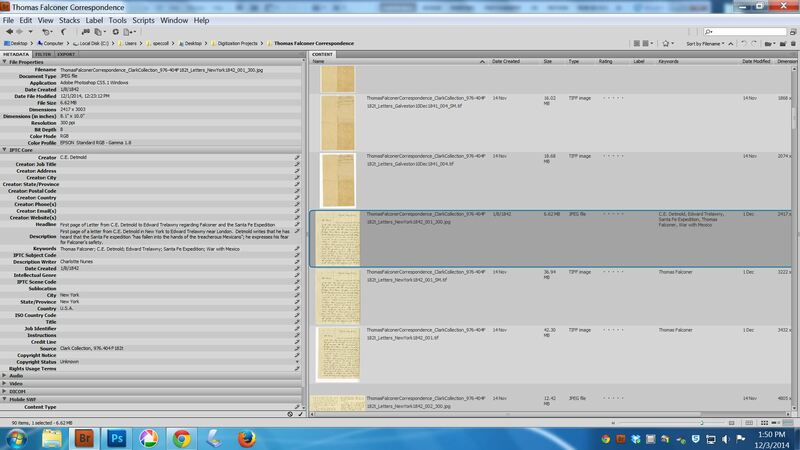 Above is a screenshot of Adobe Bridge, the program we use to manage the metadata for each digitization. The digitizations appear on the right side of the screen; to the left are the metadata fields, covering categories such as Creator, Date Created, Description, Source, and Copyright Notice. Below, Emily Russell, University of North Texas Capstone Student Extraordinaire, is pictured at the digitization station where all the magic happens. Along with the rest of our team of interns and archivists, we take turns doing work at this station. Emily is contributing her digitization and metadata expertise to the Digital Texas Heritage Resource Center as part of her graduate degree in Information Science. 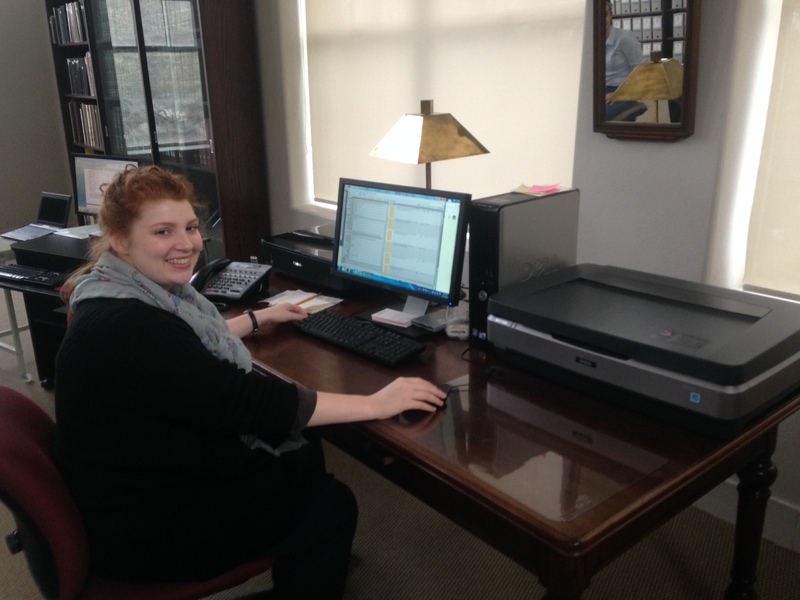 Emily Russell getting things done at the digitization station. To the right is the flatbed scanner used to digitize documents and photos; on the computer, we save multiple versions of each scan and enter metadata for each image into the Adobe program Bridge. The Digital Texas Heritage Resource Center initiative is off to a great start. Updates to follow as items become available at the Portal to Texas History!